"Inspired reading, not required reading"
Over the next few months, the grade 9 students of the Calgary Science School will be reading books of their choosing, reviewing and critiquing them in search of the ultimate novel for their class. Taking inspiration from the CBC's "Canada Reads" contest, all 100 students, 5 teachers and 2 student teachers will all be participating. The project will run through a series of "rounds" and students will track their reading, thinking and writing about their selected books through personal blogs and videos. 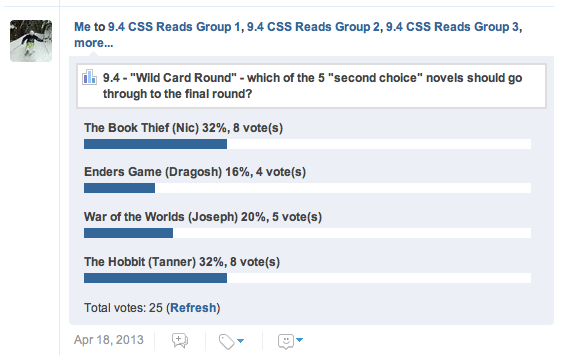 In the end, the students will work together to select one book that is the most meaningful and important for their classes of 25 that will then form the final four that will face off for the CSS Reads 2013 title (and will be the four reading choices for a 2013-14 Grade 9 novel study). All 100 students participated as we were rejoined by "CSS-Ghomeshi" (Mr. McWilliam) for the closing debate. The four finalists did a tremendous job and they all represented their novels admirably. Check out the live twitter feed and highlights from the closing debate on the right (or follow us @CSSReads). Above: CSS Reads: The Teachers' Debate - special thanks to Mr. McWilliam for being our "Jian Ghomeshi," and to Niran for filming the "episode." Below: Edmodo was a great tool for the students to use in their debate groups for daily de-briefs and sharing information about their novels. All students selected a second novel to read from the list of "contenders" (a book read by one of their peers in Round One). Students discussed strategies for comparing two different texts - analyzing theme and the elements/strategies that authors use to develop it (characters, plot, setting, language). Keeping in mind the essential question - why is this novel meaningful and relevant for CSS grade 9 students? - Students created video critiques comparing their two books. With the video critiques complete and blog posts from round one - students will now be placed into debate groups of 5 (each representing one novel - their favourite of the two that they have read) for Round 3, when the eliminations will begin towards selecting one winning book for the entire class. OUR SCHOOL IS EXCITED ABOUT CSS READS! This video is a book introduction and defence from Dr. Garry McKinnon, our school superintendent. Students are working on their own video critiques of their 2 novels this week. Garry and the entire administration are very supportive of our project and they will be dropping-in on the student debates next week. This clip from CBC's "Canada Reads 2013" is an example of the type of process that our students will be going through. Every Grade 9 CSS student chose a book or novel to read independently. The only requirement was that they had to select a novel at minimum Grade 9 reading level. As an incentive, all students were challenged to select a book that is so important, that every Grade 9 student in the school should study it next year. The elimination rounds later in the competition have been designed to allow the Grade 9 class to select 4 winning novels that will become reading options for a 2013-14 Grade 9 novel study unit. While reading their book, each student launched a blog, and wrote and posted a short synopsis and a critique to begin promoting their books. Students also created "Digital Book Covers" with their synopsis and a QR code link to their blog to promote their novels within the school.